Today is preparation day - buying in the food and getting the kitchen space ready for all those hearty and soulful treats during the work. Setting up the bright and airy meditation space. And above all, working with the energy of the surrounding field to get it aligned for the work. We're creating a portal of energy, where the veils through the densities all the way back to the source are peeled away. It means participants can sit in an energy vortex through their inner explorations, which brings issues and blockages quickly to the surface. These can be quickly cleared allowing deep soul attunement to follow. 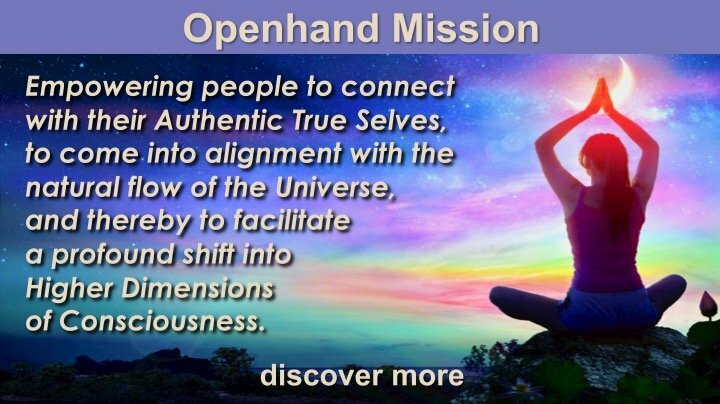 It's always a joy to behold people breaking through and reconnecting with new aspects of higher dimensional self. What a joy! People are flying in from across Europe for the first gathering this afternoon at 4pm. We'll begin by inviting people to share where they're at on the spiritual journey at this current time. What's going in your life? The deep inner inquiry facilitates profound shifts in consciousness. Come join us. What's going on in your life right now? So what's an Openhand Course all about? How does it work? We create an energetic portal, where the veils through the dimensions and back to the source are very thin. In guiding people through deep consciousness meditation, they'll quickly open to aspects of themselves in and through the dimensions: both the true self waiting to be activated and unveiled; also subconscious density that everyone carries unknowingly around with them. In these deep meditative states, we let the field intuitively guide us. As the lead guide, I'll use poignant explorations of reality to test the mental and emotional limitations that fix people into a limited consciousness. "The truth" - a deeper version of your own - sets you free. It literally connects you with the mainstream of your soul flowing down from the source. At this point, karmic blockages that people carry around will activate. It's like the mainstream of the soul recognises them as limitations and 'lights them up'. The density activates in people's fields - it doesn't feel pleasant, but then we apply powerful processes to regress into the activating density to quickly release it. We're then looking for those lost nuggets of soul-gold that were previously buried in that 'sediment'. By reminding people of their true sense of self, using breath, movement, meditation and the profound exploration of truth, these nuggets are integrated into the mainstream of the soul inside. There's a deep upwelling, an "aha" moment - it's like coming home to yourself. And there's nothing quite like it. All the journeying has been worth it. And now life changes profoundly as your new integrated consciousness manifests a more harmonious reality - it's pure alchemy! Here are some pictures capturing a glimpse of it all. Empath Emilia, supporting as a facilitator through the field, activating repressed density - go for it Emelia! An hour later - "phew, this work turns you upside down and inside out!" They say an 'army' marches on it's stomach. Well this fortunate team of lightwarriors certainly does! I just love seeing the intensity of the experience on your faces, everyone in Bruge. You are so alive! The picture with Open "in session after a session" moved me quite a bit. I know I said this before, but it is deeply touching how you (Open) are present and 100% in within the exchange in every retreat I participated in. I just feel this gratitude for who you are and the gift of your being. Now, as far as the food images are concerned ... yum yum yum ... I feel like making Trinity's lentils shepherds pie or falafel today (haven't decided which one yet and perhaps I'll do both). I'm positively inspired by your creations, Trinity. Radiance is just flowing from these photos! Love the goats, how wonderful to have animal energy around a retreat! Wow, this looks like a fantastic retreat! There's so much life in all the photo's, if ever there were 2D/3D images of 5D living this would be it! These photos are so great at building the energy especially for those of us who are tuning in from afar. So massive thanks to Trinity for that. I love how on these courses, there are such an amazing blend of different energies, brought by everyone who attends. And no matter how deep into the dirt everyone goes, there's always a laugh just around the corner - its like going through all that darkness just amplifies the light shining forth at the end of it! What a magical week that was! My deepest gratitude to you all for making it happen! Open, for reflecting the One back to us, Trinity for nourishing our inner being, Emilia and Jean-Michel for holding the space and my fellow participants for the beautiful reflections of myself. Coming back, the confrontation with the density has already been quite full on and I am getting better at noticing some of synchronicities that the universe is constantly reflecting back to me. I have come down with a flu/cold yesterday, though it feels more like an energetic than physical process. Then today I had an interesting revelation about a situation that has been challenging me for a while now. To cut a long story short, the heating system/boiler of my downstairs neighbor has a mysterious problem, which every now and then causes a loud banging noise in the shaft with pipes running through my bedroom, like a train rushing by, waking me up multiple times at night. For nearly 1.5 years I have been desperately trying to get the housing organisation to resolve this problem, with no success so far. Other than the thought that perhaps this is telling me that it is time to move somewhere else, the whole situation has been driving me crazy with feelings of not being listened to, not being taken serious (I have already been blamed for exaggerating, not cooperating, etc. ), desperation and despair. Then today I was on the phone with the responsible guy at the housing organisation, who drives me most crazy. Because he never listens to or takes the information I share about the situation into account and therefore keeps on coming up with possible solutions that I already know won’t resolve the problem, but then when I start asking critical questions, he considers that I am not cooperating and trusting him. As I was on the phone with him, I was very aware of how he didn’t acknowledge anything of what I said and the feeling of not being heard coming up. This time I felt bold enough to express this to him and right as I was trying to do so, our phone connection was cut out of nowhere. To me a clear confirmation from the universe and an invitation for me to feel into ‘not being listened to’. Then later he called me back to continue the conversation, which eventually ended in a verbal fight were some of my anger just blurted out and I hung up on him. As I was reflecting on what this whole situation was mirroring to me, I suddenly realised that the way he doesn’t listen and just imposes his solutions, is exactly what I do internally with the flow. The flow is talking to me loud and clearly, but I don’t listen to it or take it seriously, just like I feel this guy has been doing with me. Until the flow starts getting so desperate that it will get ‘angry’ at me (flu/cold or other disharmony?) in the hope that I will finally listen. The flow is trying to restore internal harmony (no more banging noise), but by not listening to it, disharmony remains. I suddenly saw it very clearly and realized that this probably means that the noise problem at my house won’t resolve until I start listening to, trusting and cooperating with the flow, rather than ignoring it. But at the same time surrendering to the flow feels absolutely terrifying and I would much rather run away from the situation. To be continued….. It's lovely to hear your sharing - even though of course challenging. "I have been desperately trying to get the housing organisation to resolve this problem, with no success so far. Other than the thought that perhaps this is telling me that it is time to move somewhere else, the whole situation has been driving me crazy with feelings of not being listened to, not being taken serious." Remember we said authentic creation follows authentic consciousness? I've so often heard from people who've founded difficulty in a particular situation and tried to resolve it by simply changing the circumstances, only to recreate the exact same patterns elsewhere. So always the question first must be... "What is this showing me? How am I identifying with the situation and being less than I really can be?" If it's a distortion, then work into it. If it's a gift of beingness, work to attune it. Then let Right Action flow from there. Here's a golden opportunity - to take a real life challenge, and instead of trying to fix the circumstances (which are only the symptoms), work instead to unveil more highly evolved consciousness. Example like these can be literally life changing. Marije Thank you for your sharing it really kicked up a realization about myself. Deepest Gratitude to You! Thank you for all the beautiful pictures. I was tuning in with you all during the week and it's so lovely to see a 2D glimpse of the retreat. The goat in the studio cracks me up. Thanks so much for posting those unbelievable shining pictures of the retreat . It was indeed a very special and Magical week all together . The Belgian Group energy is coming together , which is so great . Open, thanks for your feedback! I definitely recognize myself as someone who often sees running away from a situation as the easiest solution. Things have been pretty full on since I am back from Bruges, it is amazing how quickly one can get sucked back into the density of daily life. When I was reading your feedback I caught my mind wanting an immediate answer to the three options that you gave, to know how to best move forward on this, but I managed to leave them up in the air until now, without really knowing what this situation is showing me. The closest I have come so far is that it has something to do with (avoiding) confrontation, around which I can feel a lot of tightness that I haven’t fully managed to confront. In the case of the housing organization, the next step would be to send them a registered letter with a formal complaint, then to file a complaint against them with the municipality for overdue maintenance, so that they will be forced to resolve the issue. However, I have been dreading to write this letter for a while now and have kept on finding excuses for postponing it, hoping that the problem could still be resolved ‘in a nice and peaceful way’, rather than having to enforce it through a formal complaint and getting the municipality involved. I can feel a lot of fear around confrontation and potential conflict, though I am not sure why, there seems to be a strong fear of being defeated. If I ponder on what this reflects about what’s happening inside of me, then it is perhaps a tendency of trying to resolve my inner tightnesses ‘in a nice way’ and finding excuses to avoid full confrontation with them. And perhaps there is a fear of being defeated by what a full on confrontation could bring up, that it could be too overwhelming to cope with. Something to explore further…. Trinity, the pleasure was all mine! I miss your delicious food and can’t wait to taste more of it in the future. Eddie, I am glad to hear that my experiences can also be a helpful mirror to others! What an utterly divine week! What an utterly divine week! I can still feel the vibes coursing through my whole body & biosphere. Open, heartfelt gratitude for creating such a powerfully dynamic & graceful space to lead us all though various layers & infuse more Soul. We felt so embraced!! And Trinity, aaaaahhh, there are no words for the magical Angelic goodies that you nourished us with. Your radiant Beingness is such a gift! At the end of the week together, I had this sense of expansion. But I didn't realise how very tangible it was until I got in my car and started driving. Even though it's a small vehicle (a mini), I kept getting the feeling that I would hit the oncoming cars, and pickets or rods lining the road, as if my car was much, much wider than its actual dimensions. It took me several days to integrate this expansive feeling with 3D structures in our environment. Hilarious! And the dancing… rekindling the excitement and zest for life through movement and music - Wow! Such precious memories of sharing those sublime moments with you all!